Mahatma Gandhi (1869-1948) quote on superiority and tolerance, September 6, 2014. (http://thousayest.wordpress.com). Today’s date marks three decades since I decided to stop wearing my kufi in public, my first day of tenth grade at Mount Vernon High School (NY). It also marked my coming-out party (so to speak) as a Christian and a day of defiance toward both my Mom and my idiot stepfather Maurice Washington (now deceased), all of which is well-documented here and in Boy @ The Window. What I haven’t spent much time or space writing about was how my one-time classmates received me in terms of my kufi or the Hebrew-Israelite religion during the three years between the start of seventh grade in ’81 and the end of ninth grade in June ’84. Sure, I’ve talked about Alex and the “Italian Club,” kufi battles and other incidents involving my classmates in which bullying or attempts at bullying occurred. How much were these incidents about me, about me being poor and Black, about me being weird and Black, about me and my kufi? It wasn’t always clear. What was clear was that the vast majority of my classmates, though they may have given me weird looks or quietly snickered, said nothing to me one way or the other about my kufi or my religion. But on that first day of tenth grade, the day I stopped wearing my kufi, my classmates were hardly silent at all. On some level, I could accept this answer at face value. But even at the moment of the interview, I didn’t find this former classmate’s answer enlightened or satisfying at all. His answer on the surface demonstrates the very definition of tolerance. Yet tolerance through silence is the absolute minimal definition of respect for differences. Tolerance is hardly the same as accepting or embracing differences, defined by taking active steps to understand and empathize with different peoples and cultures. Not to mention taking the extra step of working to protect those people and their differences from the intolerant. 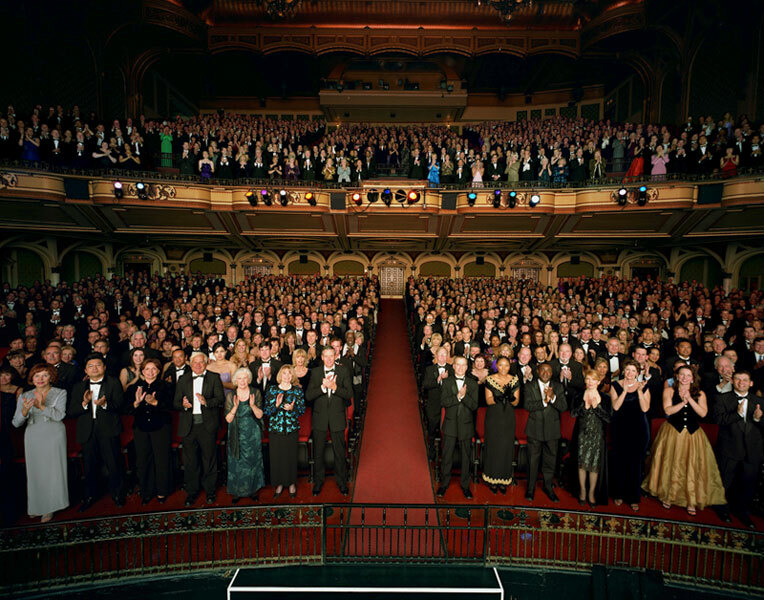 Standing ovation, opera house unknown, May 21, 2012.(http://www.thelmagazine.com). I knew on some level even in ’84 that many if not most of my Jewish classmates had remained silent because the idea of Blacks as Jews in terms of religion or genetics was barely in their consciousness. It’s still hard for many Jews I’ve known over the years to accept now, even with a population of Ethiopian and other East African Jews living and working in Israel. It’s difficult to embrace the mosaic that is the Jewish diaspora, even with evidence pointing to communities made up of the descendants of some of the so-called Ten Lost Tribes of ancient Israel living in southern Africa and northern India (as documented by the Discovery Channel in documentaries over the past fifteen years). Me as a kufi and yarmulke-wearing Black teenager practicing Judaism had to be weird and beyond the pale for those classmates. 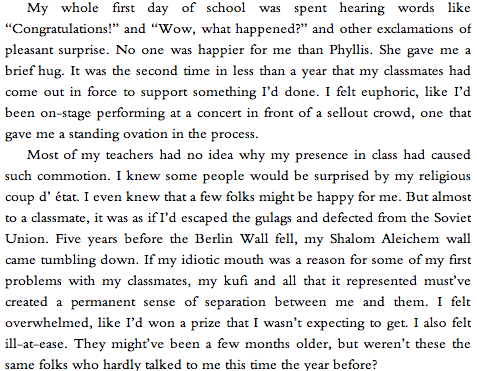 The way the rest of my classmates reacted to the end of my Shalom-Aleichem-days was also an example of minimal tolerance, or really, intolerance. In six years of Humanities, I’d never gotten that many of my classmates to pay attention to me for longer than an answer to a history question unless it was for ridicule or for a presentation or an award. The fact that at least two dozen had something positive to say about my lack of a kufi, or upon further inquiry, my turn to the Christian side, told me all I needed to know about my status with my classmates for the previous three years. I’m hardly excluding myself from this notion of intolerance. My view of myself as a Christian in those first months after I converted was one that set me apart from Catholics, Baptists, Jehovah’s Witnesses, the Nation of Islam and Jews alike. I didn’t necessarily think or say things about these different religions or the classmates who practiced them. I just ignored those differences while giving every appearance that my nondenominational view of Christianity, my Bible-quoting and toting self, was the only lens through which anyone should view themselves and the world around them. It would be another year before I recognized my own childishness regarding my views of spirituality, religion and tolerance.